Students on the KBS Business Start-Up Journey have had the rare opportunity to observe a real-life investors meeting. The Kent Investors Network held its February meeting at the Kent Business School’s Canterbury campus with five businesses seeking investment. Such meetings are normally held in private, with only potential investors and businesses invited. The opportunity for students to see behind the scenes has arisen through the Kent Business School’s extensive network of contacts in the county’s business community. 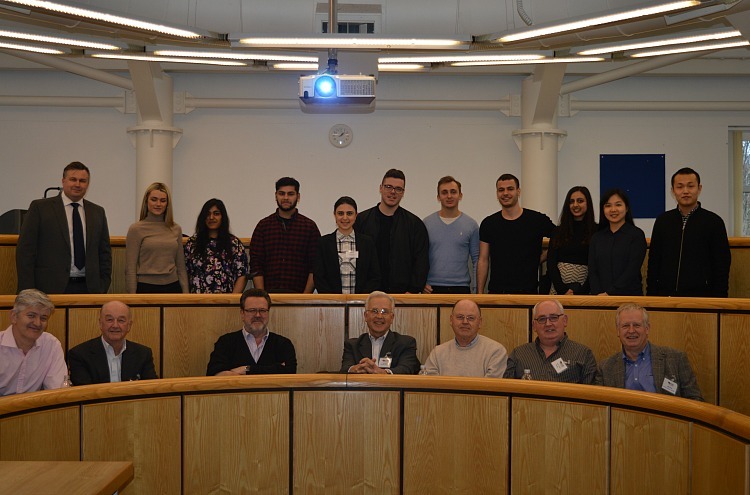 For students on the Business Start-Up Journey – the business school’s flagship student enterprise programme – it was a chance to see how potential investors would scrutinize a business looking for financial investment. At the end of the Journey, selected students will themselves pitch their ideas to a panel of judges, hoping to win a cash award to develop their business beyond the programme. The Kent Investors Network was founded in 2009 and is comprised of a group of angel investors who consider investing in high-growth businesses or start-ups seeing funding. Typical investments range from between £50,000 to £1million. Members are generally successful business people from a range of backgrounds including finance, e-commerce and marketing. The Business Start-Up Journey is part of the Kent Business School’s ASPIRE (Accelerator Space for Innovation and Responisble Enterprise programme. A philanthropically funded programme, it provides a place for students to meet, collaborate and learn about entrepreneurship. ASPIRE will also deliver research in the areas of responsible enterprise and innovation. Find out more about the Kent Investors Network and the Business Start-Up Journey.